Riad White Flowers i Marrakech, Marokko: Reservér nu! 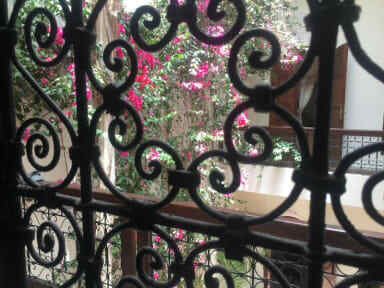 Located in a quiet alley of the Medina, in the oldest district of Marrakech. Riad White Flowers is aptly named. It combines elegance, creativity and freedom. Two minutes from Jemaa El Fna square, this ebony black, chocolate and ivory white will seduce you with its simplicity, the refinement of its refined but well chosen decoration. The materials are rich, pure, oscillating between the solid wood of carved doors, the smoothness of ironwork and brass, the Matt and delicate touch of tadelakt. The tapestries and carpets are ocher red, the color of the city, the African and orientalist furniture and paintings invade the space. Riad White Flowers is located just two minutes from Jemaa El Fna square, and one minute from Palais Bahia, this oasis place has a best location in Marrakech, everything is near by, restaurant, many coffees, historic monument and parking. This unique place is distinguished by its appeasement for the mind, eyes and body and will enchant your nights and days. At the heart of the patio, you will find a little pool. 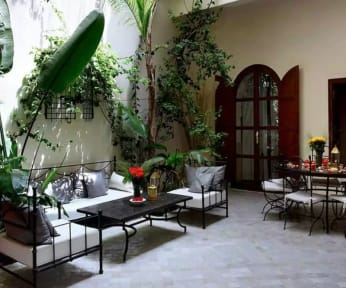 Endowed with multiple quiet and cozy spaces, to read, to rest, to meditate, to dream of a better life, the Riad White Flowers, whose owner is man of television and lover of Morocco for more than six years.